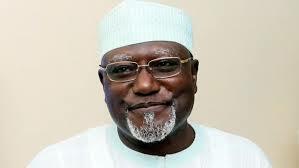 By Sadiq Umar – Sacked Director General of the Department of State Service (DSS), Lawal Daura, has been completely demoralised by the wide spread insinuations of working for the opposition following the recent siege on the National Assembly by masked DSS officials, report says. Mr. Daura who was relieved of his post after the incident, a source disclosed, is not happy that he was labelled a mole of the opposition for his action even when the decision was a collective decision. Unconfirmed reports had claimed that the ex-spy chief was working for the President of the Senate Bukola Saraki, to undermine the presidency. According to a report published by PRNigeria, a news agency platform, the former DSS boss is insisting he took all actions in national interest through a collective responsibility, including involvement of principal officers of sister agencies even though he did not disclose who authorised the siege on the National Assembly (NASS). Quoting a source close to Mr. Daura, the report said it learnt on good authority that neither was he given query over any issue nor indicted on his handling of affairs of the service until his sack. “While the former DSS boss has not officially handed over up till now, his house both in Asokoro and Gwarinpa were thoroughly searched in the night and nothing incriminating were found, and all items found including necklace, praying mat, CDs, ATM card, women bags, documents and receipts have been duly returned to him accordingly,” it further disclosed. The source also stated that when he was invited by the then Acting President Yemi Osinbajo for the security briefing, he quickly rushed out and left some of his personal belonging including phones in the office. He noted that when he was whisked away and eventually sacked, he did not know his offence. Meanwhile, fresh facts emerging from the presidency indicate that the ex-DG DSS may have been fired for undermining the office of the acting president. News Investigators reliably learnt Mr. Daura’s offence includes insubordination to the person and office of the Vice President, Yemi Osinbajo. Prior to the incident at the National Assembly, the sacked spymaster, it was further learnt had been particularly rude to the Vice President, even at his previous reigns as acting president. Mr. Daura, the source further informed, had defiantly refused to answer the verbal query by the acting president on why he was not informed of the deployment of the deployment of DSS men to NASS that faithful day. “Even when he was asked to report at the acting president’s office alongside the Inspector General of Police by 10:am, he didn’t show up until after 1 o’clock,” the source revealed. The development, it was gathered, had prompted angry reaction from the acting president who immediately put a call across to President Muhammadu Buhari, expressing his displeasure about Daura’s continuous insubordination. “He even threatened to quit the government rather than allowing his authority to be eroded. It was at that point Mr. President told him to do whatever he deemed appropriate as the acting president,” the source added. But Mr. Daura in the latest report claimed he did not act alone on the deployment but rather with head of some sister agencies. However, the new development from the sacked Daura-born security chief has contradicted the report submitted by the Inspector General of Police (IGP) Idris Ibrahim that Lawal Daura, has confessed that he deployed hooded Operatives of the Secret Service to the National Assembly complex based on intelligence report that unauthorized persons were planning to smuggle dangerous weapons and incriminating items into the Federal Legislative complex. His purported confession was disclosed in an alleged interim investigation report submitted to the then Acting President, Professor Yemi Osinbajo. In the report, the IGP argued that Mr. Daura carried out the siege on the National Assembly, without the approval of the Acting President. “The former Director-General, Department of State Security Services, DSS, Lawal Daura, acted unilaterally, without informing the Presidency. He did not share or intimate other Security Agencies on the unlawful operations”, Mr. Idris had stated in the report.